THRIVE W is a premium formula and a premium approach to your daily lifestyle. The result of scientific research and years spent perfecting the formula, THRIVE W is the only premium lifestyle capsule of its kind. THRIVE W is about reaching for more and achieving more, each and every day. Part of the innovative, yet simple THRIVE Experience, THRIVE W is Step 1 of the 3 Simple Steps in the THRIVE Experience. THRIVE W is formulated for every woman who's thriving for the ultimate daily lifestyle, our premium grade naturopathic formula of Vitamins, Minerals, Plant Extracts, Anti-oxidants, Enzymes, Pro-Biotics, and Amino Acids is the first and only Ultra Premium Formula ever developed. 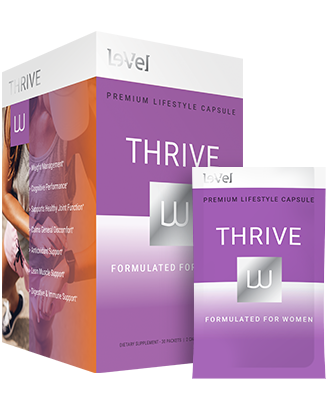 Live more, be more, experience more, THRIVE for more with THRIVE W.
Learn more about the THRIVE Experience here.